Compomotive Wheels Black & Foil Wheel Centre Stickers. Set of 4. 50mm. 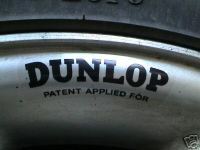 A set of 4 Compomotive Wheel Centre stickers. Black & Thick Chrome Foil finish, as shown. Machine cut to circular shape, to the edge of the black (white square background is backing paper and is not part of the sticker). Compomotive Wheels Red & Foil Rim Stickers. Set of 4. 60mm. Compomotive Wheels Black & Clear Rim Stickers. Set of 4. 60mm. Compomotive Wheels Coloured Circular Stickers. Set of 4. 50mm. Akront Yellow & Silver Oval Stickers. Set of 4. 1.25". 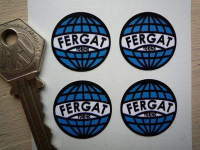 Fergat Torino Wheel Stickers. Set of 4. 25mm. 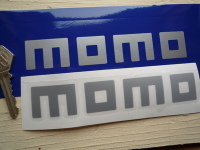 MOMO Racing Cut Text Stickers. 6" Pair. Akront Red Oval Stickers. Set of 4. 1.25".